Thank you for visiting me. If you think that talking to an entirely neutral and non-judgemental soul would help you find your inner path to being at one with the Universe then I hope I may be able to help you. I make no claim other than I have a natural aptitude for healing, although I seem to have powers far beyond just this that I have yet to fully understand. This is because other people's perception of me varies depending on the culture and belief system of the individual I am talking to. Most consider me to be a shaman which seems to be a fair description if by that you mean 'one who has faced themself' but I cannot label myself into a particular box in relation to culture as I have no understanding of these matters. Perhaps the best description is that I am a metaphysician and work with the highest natural energies of all through links into the other dimensions and time frames that under-lie the space-time that we all 'see'. The phrases I use to describe myself are 'Guardian of Time' and 'Navigator for Souls'. Others have told me I hold the boundary between this reality and all others and am guardian of it - I am both of this world and also a 'walk-in' from another star system. This is a complex area of philosophical discussion which involves large scale quantum entanglement in time - all I know is that it is what I am, so have a look at my About Me page to know more. I never suggest courses of action as these become apparent when talking to the individual - in fact the Universe does not allow me to initiate events as this would negate a persons free will. The process of finding ones path starts with the ability of the individual to recognise and accept themselves. Once this has been achieved then all is possible. If you would like to talk to me and learn more then please click on my Contact Me button above. You may well ask why 'Talking with Capricorn'. This is a simple name with lots of connections! I was born on December 23rd so am a Capricorn. This day is immensely special in the Celtic calendar in that it is called 'The Secret of the Unhewn Stone' and is for Guardians. In the Celtic tradition of law making it is the day used in the saying 'For a Year and a Day'. 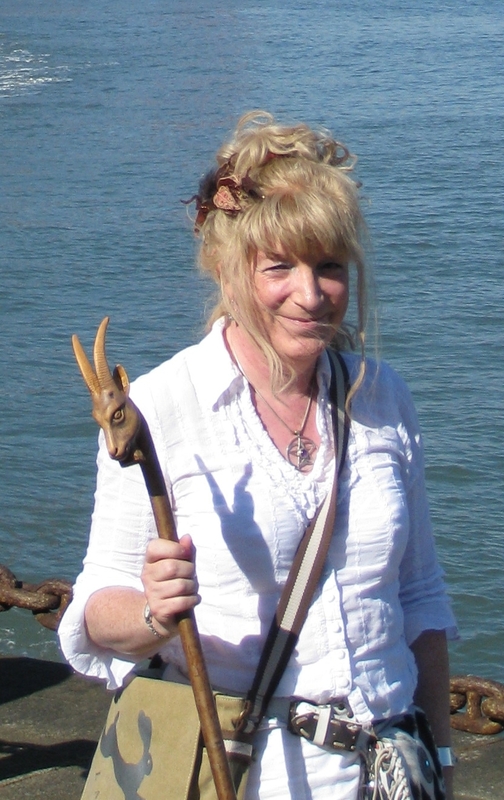 My staff is called Capricorn for obvious reasons when you look at my photo above! Capricorn relates to Saturn and Saturn relates to Time and hence 'Guardian of Time'. Mind you, he is usually refered to as 'Number 8 Goat' as the man who carved him kept Number 7!